I was at a party in NYC at the beginning of my first year at NYU. The party was hosted by a friend of mine who was doing research at the Museum of Natural History in New York. Somehow the topic of recording whales came up (as it does) and I immediately figured out what I would be researching for that semester. Little did I know that it would make me the ‘dolphin guy’ for the next two years in my program. The first thing that I did was build a hydrophone (underwater microphone), which was surprisingly easy thanks to the tutorial at www.dotsits.org. From there I started recording sounds in my tub, pots and pans, my parents pool, and eventually worked my way up to the ocean. It’s amazing what people will let you do if you say that you’re a graduate student doing research. I managed to get a free whale watching trip in Monterey and also discovered that I now get sea sick, despite spending several summers prior fishing off the coast of Mexico. Anyway, it was a great trip as I was able to hear both whales and dolphins. The dolphins actually started playing with my microphone once they figured out that I wasn’t trying to hook them. 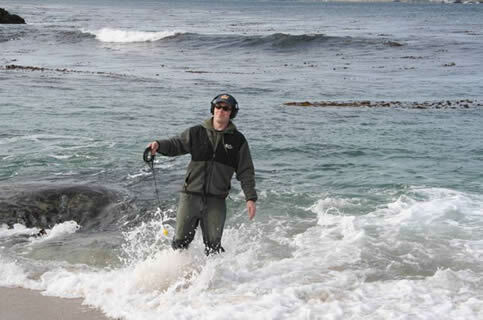 I would definitely encourage anyone to go ahead and make that hydrophone, as it was very easy and lots of fun to play with.